Products Color TV Game, Game & Watch, NES, Game Boy line, SNES, Virtual Boy, Nintendo 64, GameCube, Nintendo DS, Wii, Nintendo 3DS, Wii U, Nintendo Switch and various video game titles. Nintendo Company, Limited (任天堂株式会社, Nintendo Company, Limited) is a Japanese multinational corporation originally founded on September 23, 1889 in Kyoto, Japan by Fusajiro Yamauchi to produce handmade Hanafuda cards. In the mid-twentieth century, the company tried several small niche businesses, such as a Love hotel and a taxi company. Over the years, it became a video game company, growing into one of the most powerful in the industry. Aside from video games, Nintendo is a minor owner of the Seattle Mariners, a Major League Baseball team in Seattle, Washington. As of March 31, 2014, Nintendo has sold over 670.43 million hardware units, and nearly 4.23 billion software units worldwide. 4 Development of Super Smash Bros.
Nintendo was originally a card company from 1889 until 1956. From 1956 to 1975, Nintendo changed its product. During the period of time between 1963 and 1968, Nintendo set up a taxi company, a "love hotel" chain, a TV network, a food company, and several other things, including a toy remote controlled vacuum cleaner called Chiritory which was later seen as a two-player game in WarioWare, Inc.: Mega Microgame$!. In debt, Nintendo struggled to survive in the Japanese toy industry; it was still small at this point and dominated by already well-established companies. Because of the generally short product life cycle of toys, the company always had to come up with a new product. This was the beginning of a major new era for Nintendo. In 1970, Hiroshi Yamauchi, the third president of Nintendo, was observing a Nintendo hanafuda factory. He noticed an extending arm, which was made by one of their maintenance engineers, Gunpei Yokoi, for his own amusement. Yamauchi ordered Yokoi to develop it as a product for the Christmas rush. The Ultra Hand was a huge success, selling approximately 1.2 million units, causing Yokoi to be moved from maintenance duty to product development. The 1970s also saw the hiring of Shigeru Miyamoto, currently one of the most influential people in the video game industry. Nintendo's logo from 2006 to 2017. Nintendo eventually saw how popular video games were and decided to create them. During the late 1970's and 1980's, Nintendo began to make arcade games and eventually game systems. Once their systems gained much popularity, Nintendo then began to make handheld systems, making the company even more popular. Nintendo continued producing updates of these two concepts, leading it to become one of the world's most recognized video game manufacturers. Nintendo's main line-up of video game systems currently includes the Nintendo 3DS, New Nintendo 3DS, Nintendo 2DS, and the Nintendo Switch. The Nintendo Switch, which was the successor to the Wii U, was released worldwide on March 3, 2017. Game Boy Camera - a monochrome camera cartridge for the original version of the Game Boy, includes a simple picture editor and ability to print pictures via Game Boy Printer. Broadcast Satellaview - Only released in Japan, an add-on for the Super Famicom (Japanese SNES) that allowed anyone to download games by a satellite. Game Boy Player – An adapter for playing Game Boy games on the GameCube. Game Boy Printer - An adapter designed for printing things from the Game Boy. For example, it was used for printing out Pokémon information from the Pokédex in the Game Boy Pokémon games. iQue Player – A version of the Nintendo 64, with double the clock speed and downloadable games, released only in the Chinese market. iQue DS - A version of the Nintendo DS, released only in China. Nintendo 64DD – Only released in Japan, this add-on system's games are on re-writable magnetic disks. Games released include a paint and 3D construction package, F-Zero X Expansion Kit, for creating new F-Zero X tracks, a sequel to the SNES version of SimCity, SimCity 64 and a few others. A complete commercial failure, many speculated that Nintendo released it only to save face after promoting it preemptively for years. Pokémon Mini – Unveiled in London at Christmas 2000, the Pokémon Mini was Nintendo's cheapest system ever produced; with games costing £10 ($15) each, and the system costing £30 ($45). This remains the smallest cartridge-based games console ever made. Sales of this system were rather poor, but, unlike the Virtual Boy, Nintendo made a profit on every game and system sold. Mobile System GB - Released in Japan, December 14, 2000. The Mobile System is an adapter to play Game Boy Color games on the cell phone. The game Pokémon Crystal was the first game to take advantage of the Mobile System. Someone can hook an adapter to their Game Boy and connect it to a mobile phone which people can receive news, trade, and battle with other players across Japan. Pokémon Pikachu - A handheld device similar to the popular Tamagotchi toy that allowed the user to take care of Pikachu in the manner of a pet. Super Game Boy – Adapter for playing Game Boy games on the Super NES, which would be displayed in color. Super Game Boy 2 - A newer version of the Super Game Boy that, unlike the previous version, could also play Game Boy Color games. Triforce – An arcade system based on Nintendo GameCube hardware, developed in partnership with Sega and Namco. Yakuman – A handheld Mah-jong game released in 1983. Amiibo - Playable figures used to improve gameplay in various games. Left: Nintendo's main headquarters in Kyoto, Japan. 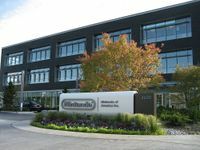 Right: Nintendo of America's headquarters in Redmond, Washington. 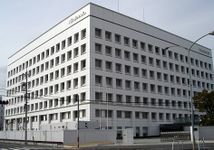 Nintendo Company, Limited (NCL), the main branch of the company, is based in Kyoto, Kyoto Prefecture, Japan. Nintendo of America (NOA), its American division, is based in Redmond, Washington, a suburb of Seattle. It has distribution centers in Atlanta, Georgia, and North Bend, Washington. Nintendo of Canada, Ltd. (NOCL) is based in Richmond, British Columbia, with its own distribution centre in Toronto, Ontario. Nintendo of Australia, its Australian division, is based in Melbourne, Victoria, and Nintendo Europe, the European division, is based in Großostheim, Germany, though Nintendo UK & Ireland is based in Windsor, Berkshire, UK. iQue, a Chinese joint venture with its founder, Doctor Wei Yen, and Nintendo, manufactures and distributes official Nintendo consoles and games for the mainland Chinese market, under the iQue brand. Nintendo also opened Nintendo of Korea (NoK) on July 7, 2006, based in Seoul, South Korea. Development of Super Smash Bros. The original of the Smash series began life as a prototype created by Masahiro Sakurai and Satoru Iwata in their spare time titled Dragon King: The Fighting Game, and originally featured no pre-existing Nintendo characters. However, Sakurai hit on the idea of including fighters from different Nintendo franchises in order to provide 'atmosphere' which he felt was necessary for a home console fighting game, and his idea was approved by HAL Laboratory. The game had a small budget and little promotion, and was originally a Japan-only release, but its huge success saw the game released worldwide. HAL Laboratory (a second party developer for Nintendo) developed Super Smash Bros. Melee, with Masahiro Sakurai as the head of the production. The game was one of the first games released on the Nintendo GameCube and highlighted the advancement in graphics from the Nintendo 64. Nintendo presented the game at the E3 event of 2001 as a playable demonstration. The next major exposition of the game came in Spaceworld 2001 in August, in which Nintendo displayed a playable demo that had updated upon the previous demo displayed in E3. Nintendo offered a playable tournament of the games for fans in which a GameCube and Super Smash Bros. Melee were prizes for the winner. At the pre-E3 2005 press conference, the president of Nintendo, Satoru Iwata, announced the next installment of Super Smash Bros. was not only already in development for their next gaming console, but would hopefully be a launch title with Wi-Fi compatibility for online play. Shortly after the announcement, Masahiro Sakurai, a former employee of HAL Laboratory was called up and offered a position as the game's director. The game was released in Japan on January 31, 2008, and in the Americas on March 9 and in the PAL region on June 27. At the E3 2011 conference, Satoru Iwata announced that a new Super Smash Bros. title was planned for the Nintendo 3DS and Wii U. Development began after Masahiro Sakurai completed development of Kid Icarus: Uprising. The 3DS version was released in Japan on September 13, 2014, and in Western regions on October 3, 2014. The Wii U version was released first in the Americas on November 21, 2014, in PAL regions on November 28, 2014, and in Japan on December 6, 2014. The 3DS and Wii U versions differ in features and stages, but retain the same gameplay, and allow for data transfer of custom characters between both versions and use of the 3DS as a controller for the Wii U version. They are the first video games with amiibo support, and the first Super Smash Bros. games with DLC, which released periodically until February 2016. At the end of a Nintendo Direct on March 8th, 2018, a new Super Smash Bros. title was announced for release later that year on Nintendo Switch. Super Smash Bros. Ultimate was formally revealed during E3 2018 and was released on December 7, 2018. All veterans from every previous Smash game return, are joined by new fighters including Inkling, Ridley, Daisy, King K. Rool, Chrom, Dark Samus, and Incineroar, as well as DLC fighters Piranha Plant, Joker, and four upcoming unnamed fighters. ↑ Company History (Japanese). Nintendo of Japan. Retrieved on 2006-07-29. ↑ Company History. Nintendo of America. Retrieved on 2006-06-04. ↑ Nintendo History Lesson: The Lucky Birth. N-sider. Retrieved on 2006-06-04. ↑ Squirl:Chiritory. Retrieved on 2007-06-14. ↑ Wii.com - Iwata Asks: Super Smash Bros. Brawl. Retrieved on 2008-01-31. ↑ Super Smash Bros. Melee. N-Sider. ↑ IGN: Spacewordl 2001: Super Smash Bros Melee hands-on. IGN (2001-08-25). Retrieved on 2007-11-24. ↑ Matt Casamassina (2005-05-17). E3 2005: Smash Bros. For Revolution. IGN. Retrieved on 2006-05-03. ↑ IGN Staff (2005-11-16). Smash Bros. Revolution Director Revealed. IGN. Retrieved on 2007-06-21. Wikipedia has an article on Nintendo. Nintendo Wiki has an article on Nintendo. Bulbapedia has an article on Nintendo. Donkey Kong Wiki has an article on Nintendo. Dragon Quest Wiki has an article on Nintendo. Fire Emblem Wiki has an article on Nintendo. F-Zero Wiki has an article on Nintendo. Golden Sun Universe has an article on Nintendo. Hard Drop Tetris Wiki has an article on Nintendo. Icaruspedia has an article on Nintendo. Inkipedia has an article on Nintendo. Lylat Wiki has an article on Nintendo. Metroid Wiki has an article on Nintendo. Nookipedia has an article on Nintendo. Pikipedia has an article on Nintendo. Starfy Wiki has an article on Nintendo. StrategyWiki has an article on Nintendo. Super Mario Wiki has an article on Nintendo. Advance Wars Wiki has an article on Nintendo. WikiBound has an article on Nintendo. WiKirby has an article on Nintendo. Zelda Wiki has an article on Nintendo. This page was last edited on April 15, 2019, at 15:02.